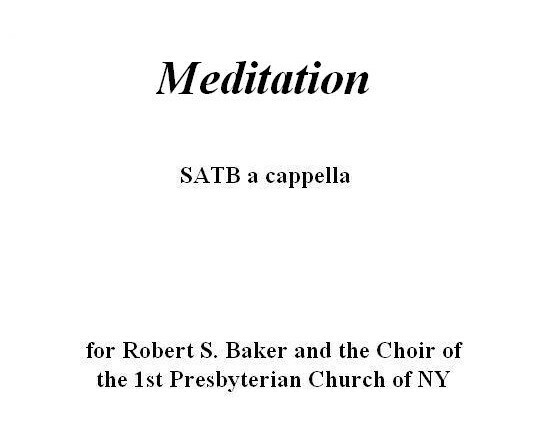 Meditation is the third anthem of an a cappella Sacred Service, which I wrote in 1981 for Robert S. Baker and the Choir of the First Presbyterian Church In New York, of which I was a member at the time. The text is the 1549 edition of the Book of Common Prayer. It was also set by Orlando Gibbons, which is how I came to know it. The recording is of a performance by the University of Texas Concert Chorale, conducted by Craig Hella Johnson. The score is available from E. C. Schirmer. Included on The New Calliope Singers, Peter Schubert, Conductor. (p) 1987 Finnadar Records.